mark your calendars - our annual june event is now in july! 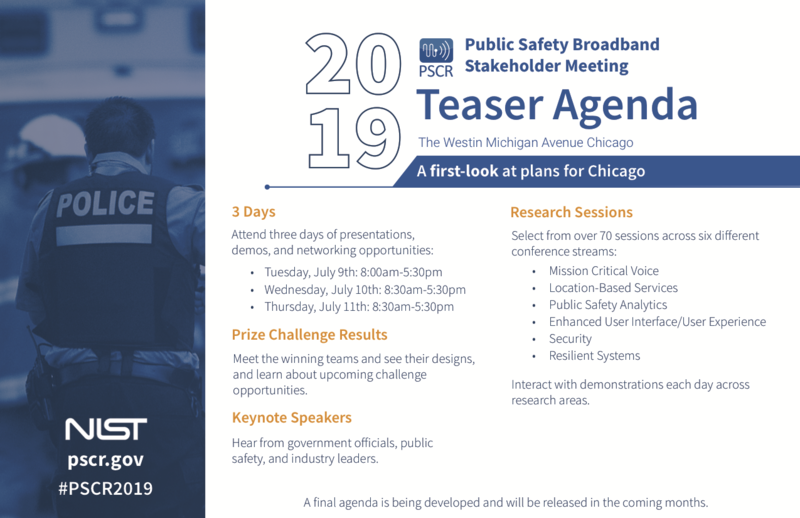 We are excited to announce that the 2019 Public Safety Broadband Stakeholder Meeting will be held on July 9 - 11, 2019 at The Westin Michigan Avenue in Chicago, IL! Register for the meeting now and stay up to date with this year's meeting design, keynote speakers, and conference resources! With only three days to showcase, the 2019 Stakeholder Meeting will be packed to the brim with research updates, prize challenge announcements/results, and networking opportunities! You can expect meeting tracks again this year, allowing you to select sessions of most interest and relevance to you and catch up on the rest later via video recordings on our website. Live demonstrations will be held throughout the week to give you more opportunities to connect with the researchers and get your hands on some of their technology. Download the 2019 Teaser Agenda! Register for the 2019 Public Safety Broadband Stakeholder Meeting here! We can't wait to reconnect with all of you at our 2019 annual meeting and plan for the future of public safety research, together. Stay tuned for a meeting agenda and the announcement of keynote speakers! PSCR does not have a general room block reserved this year. Please make your own accommodations at nearby lodging of your choice.